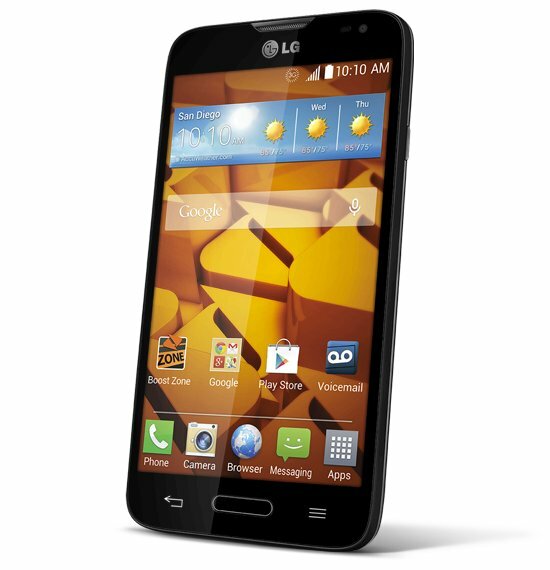 The Sprint Prepaid Group (SPG) which consists on Boost Mobile, Virgin Mobile and Assurance Wireless has launched no less that six phones over the last few days. Over a week after it went on sale on QVC, the HTC Desire 816 Phablet finally showed up on the Virgin Mobile Website. The Desire 816 features a 5.5 inch 720p HD display, 1.6GHz Quad-Core Snapdragon CPU, triband (Sprint Spark) LTE, 1.5GB RAM, 8GB on-board storage and support for up to 128GB SD cards.here's a 13 megapixel main camera with 1080 Full HD video recording and a 5-megapixel front camera. Both cameras have back side-illuminated (BSI) sensors for improved low-light performance bass-enhanced, front facing BoomSound speakers. The non-removable 2700 mAh is advertised as providing 15.5 hours of talk time. 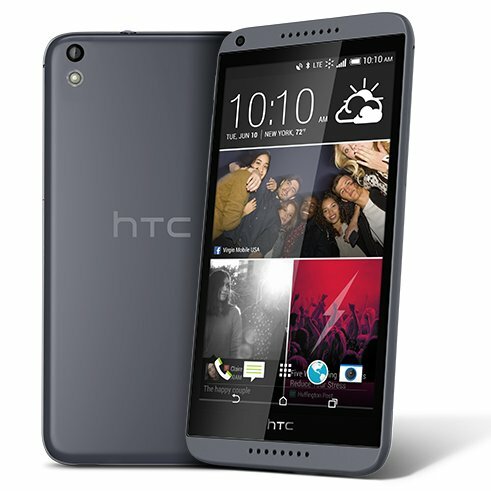 The Desire is priced at $299.99 on the Virgin site but is still available for just 199.95 with free shipping from QVC. The LG Aspire is available now from the Virgin Mobile site fro $49.99 with free shipping. Phones and airtime cards for Virgin Mobile's Walmart exclusive "Custom" service have started showing up in Walmart stores as evidenced by the photo below which was snapped at a Walmart by PrepaidPhoneNews reader Robert LeCompte. Virgin Mobile Custom is the the Ting-like service that lets users build a personalized service plan by mixing and matching different sized text, voice and data tiers. Custom is powered by software licensed from itsOn, the parent company of short lived Sprint MVNO Zact Mobile which offered a similar service. 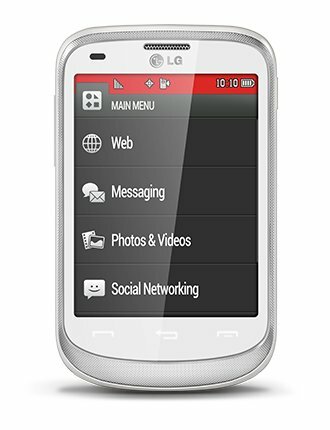 The Virgin Mobile Custom phones are the $129.99 LG Unify; a rebranded LG Optimus F3; the $79.99 ZTE Emblem, which is a rebranded ZTE Awe and the new to Virgin Mobile $99.99 LG Pulse. 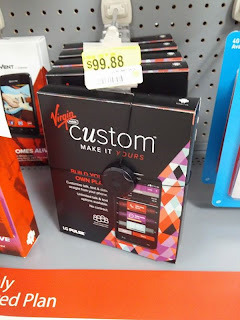 All three Virgin Mobile Custom phones are available at Walmart.com as well as in Walmart stores. Other than limited internal memory (only about 1.1GB is available for installing apps) and no LTE the new Realm and Pulse have excellent specs for sub $100 phones. Too bad the non roaming network is crap. I've seen the VM custom phones in Walmart for at least a month, but the desire looks nice. Tell that to Apple i guess. Yes, apparently the most popular, best-selling cellphones in the world have a "major design flaw." One that makes the phone stiffer and stronger, without extra, unsightly seams. That old reality distortion field again. Bud Tribble at Apple Computer, circa 1981 had no idea how powerful it was when he coined the phrase. Most of the time people upgrade before they even need to replace the battery. "...Tell that to Apple i guess...."
It's one of many reasons that Apple, to me, is a dead-last choice between any Android top-of-the-line flagship. "Yes, apparently the most popular, best-selling cellphones in the world have a "major design flaw."" Yeah, it would never happen, right? Just like bestselling GM would never make cars with faulty ignitions. Point being, Apple phones sell not because of such design inferiorities, but despite them. Because... why, people don't care what the screen looks like, but about the edges and microscopic lines that might not be there? Seam lines covered by most users, who buy phone covers? Get real.... This reminds me of when Jeff Goldblum told us that the reason to buy an iMac over a PC that cost a lot less, ran more software, was much faster, had more ports, CD drive etc etc.... was "Because it is blue". It's all marketing, really. Apple beats everyone at it, which is why they sell their more expensive, harder-to-use phones (compared to their competitors) much more than one might expect. As for removable-battery-related seems, and how important they are to any user, I will wait for your report about how this weighs into user's purchasing decisions. I expect I will be waiting a loooong time. And, objectively, it takes a lot of "spin" to claim that an easy-to-remove battery (on most Androids) is worse than a hard-to remove battery (users risk busting the phone trying to do it) found on all IOS devices. This is not a matter of opinion: some things are truly worse. android was supposed to cure iphone envy when it launched back in 2008. it just made it worse. all those people who settled for a clone now have to go to extreme lengths to justify their inferior equipment and google spying. like implying iphone buyers are all stupid - duped by apple marketing tricks. so pathetic. the only cure for all their tortured rationalization is to give them an iphone. "never mind the android fetish for playing with their batteries. lol"
It's because Android users throw away the battery when it gets bad, instead of throwing away the phone. You don't have to go the equivalent of an Apple Store with its lousy customer service when you need to change the battery on your TV remote. It makes absolutely no sense to have to do that for a phone.
" to justify their inferior equipment "
My current Android is better than the iPhone in all specs, and my next one will be also.
" the only cure for all their tortured rationalization is to give them an iphone." An iPhone Which I would leave unused because it is too small to use, and the tiny censored app store does not have the apps I use most. Or maybe sell it on Craigs List to someone duped by the idea that a phone that costs a lot more and does less is better. Time to get into the 2010s. It's now Android envy, with Apple scrambling to keep up with 5 or 6 other companies that have pulled ahead of them with better flagship phones. (Of course, I could change my mind on Apple products once they start to consider the user experience and get rid of show-stopping, objectively worse "features". Competition is good. And having to keep up with LG, HTC, Samsung and the others will make Apple's products better and cheaper). "...all those people who settled for a clone..."
Concerning Android phones and "google spying". This is a very bad problem, concerning our "electronic freedom" and civil liberties. However, it is not a good thing for a rah-rah Apple fanboi to bring up, due to this and other realities. Apple's problems with spying and the Big Brother security state are extensive and disturbing. "Don't you just hate it when there's someone in the cinema taking photos, or talking on their phone? How unfair is it that 'they' cheated on their test because they could access the Web, and yet you only got half their marks? Isn't it a shame you can't take a photo of the police officer beating a man in the street because your oppressive government remotely disabled your smartphone camera? A new patent granted to Apple could do all of the above." This is of course harder to do on Android, because the system is more open and user-responsive, to make it easier to apply a patch to shut this off if Google ever tried this. I also remember that for a long time Apple censored an app that reported on military drone strike all over the world. Such censorship hardly ever happens over in the Android world. "With Apple iPhone sales falling through the floor,"
Hardly. Apple iPhone 5S sales increased 20% in 2013 over iPhone 5 sales 2012. iPhone sales were up 12.7% year over year, as of May, 2014 (Counterpoint’s channel survey across 35 countries). The iPhone 5S is still the world's best-selling smartphone 8 months after launch, with the Samsung S5 a distant second. In 2013, Apple sold over 150M iPhone 5S, while Samsung only managed 40M sales of the S4. In 2012, Apple sold 125M of the iPhone 5, compared to 70M Samsung SIII. (Wikipedia, citing CNET). You don't get to make up your own facts. The article cited is two years old. It presents both sides of the issue pretty well. As the article explains, even if Apple eventually implemented the tech, it would be up to a business or government to activate the feature (i.e., a theatre owner preventing cellphones from ringing or taking an illegal video of a movie). Hardly a case of "Apple's problems with spying and the Big Brother security state are extensive and disturbing." That sounds like paranoia to me. Google computers reading all of your gmail so they can spam you with "appropriate" ads and alert government of your illicit interests is going on right now. Apparently you have no problem with that, so keep on using android and google products. iPhone market share is declining, sales aren't.
" noticing that all growth is happening with larger phones and cheaper phones." Of course, this could change with Apple's next phone. should they choose to finally catch up with Android and copy Android features. Proper correction, then. Yes. sales are increasing, but the marketshare of Apple is diminishing, at this time, among a field crowded with competitors, many of them better choices than Apple's still limited, one-size fits few phones. For now. I trust this will be reversed some once Apple catches up and adopts Samsung/etc features, phone size family, etc. And the consumer will be a lot better off for it, both the Apple fanboi's and everyone else. "Looking back at the most recent numbers, Apple sold 51 million iPhones from Q4 (Oct. – Dec.) 2013. That is impressive, but it’s less so when you compare it to the 48 million iPhones Apple sold a year prior. It’s year over year growth for this period was 7 percent, the lowest it’s ever been by a lot." Counterpoint's newer data shows year-over-year growth of 12.7% through May, 2014. So after reading that, and then citing older data with a lower rate of growth, for only the *4th quarter of 2013* compared to 4Q 2012, you are the one who is cherry-picking. But at least you are making progress from "Apple sales are falling through the floor." I admit when I am wrong. Waiting for you to admit that it illogical to say that being able to easily change a bad battery is somehow worse than the Apple way of risking breaking your phone, following a many-page instruction list and having to buy 6 special tools just to do this operation. Then there is the keyboard situation. Objectively worse on Apple. On-screen keyboards are a cheap compromise compared to a QWERTY slider... a bit of design regression embraced by both Android and Apple.... However, the Android world offers Swype to make it more bearable. Last I knew. Apple had banned this, and you had to hack the phone to make it a lot easier to use. Just another example of the company giving no regard to user experience. Just remember: easier to do is better, harder to do is worse. "sales are increasing, but the marketshare of Apple is diminishing, at this time, among a field crowded with competitors, many of them better choices than Apple's still limited, one-size fits few phones." Apple does not sell entry-level or mid-range phones. That is where most of the market growth is taking place. So it's easy, math-wise, to see why their market share is declining. Their rate of growth has declined (in part) because the market for flagship phones has become more saturated with choices than when they started. Apple is not going to make entry-level phones, which would cheapen the brand and ultimately cause more harm than good. Apple is a premium brand and will stay that way. But they will add features that the market clearly demands, like bigger screens, even if it makes an iPhone harder to use with one hand. "Yes, apparently the most popular, best-selling cellphones in the world have a "major design flaw." One that makes the phone stiffer and stronger, without extra, unsightly seams." This is not a question of being right or wrong. It is *Apple's* stated reasons for making phones with a sealed battery, which I just repeated here. "....Apple does not sell entry-level or mid-range phones....."
That is certainly true of entry-level devices. but it is somewhat debatable when you match specs of the now long-in-the-tooth 5S with the most recent Android flagships. It does start to look "mid-range" in features if not price. "Apple is not going to make entry-level phones, which would cheapen the brand and ultimately cause more harm than good." It's this kind of idea which has perverse economic (and consumer-serving) value which could torpedo Apple. The very idea that lower-price, higher selling items that are in demand is a bad thing to have??? Again, objectively, Apple making a broader range of products would do more good than harm (to the company, and the consumers inside and out of the Apple ecosystem). The only "harm" it does is to the ego of a fanboi boasting about his $700 phone. "Apple is a premium brand and will stay that way. But they will add features that the market clearly demands, like bigger screens, even if it makes an iPhone harder to use with one hand." The current iPhone is just about impossible for me to use with one hand or two, so I personally would welcome larger easier to use phones. Samsung has an ideal approach in this, for Apple to emulate. A range of sizes of their top-of-the-line phones. Please try to keep comments on topic. Discussions about the merits of Apple products are irrelevant to the topic of this post. Thank you. Sprint prepaid makes no sense to me. They charge the highest prices for the worst network. Worst network is highly dependent on location, i have Virgin because my house is an at&t dead zone. Exactly. I was a happy Sprint customer for 16 years. Then I changed desks at work into a Sprint dead zone. Now I'm a happy at&t customer, though I have to pay $45 a month for 2.5gb vs $35 on Sprint. Oh well, no contracts, more choices! $45 a month for 2.5gb on ATT? Are you on a Cricket plan? I was now of the customers Sprint Sprint fired in 2006-2007, they were that bad, they couldn't even fix simple account issues, lost records, horrible, I am surprised they are still in business, I am banned from Sprint supposedly, I'll try not to lose any sleep, lol. After being a Sprint customer for over 10+ years, 2014 is the worst. I no longer care what kind of phones they offer. I just want a phone call that I can understand what they are saying, and vice versa. Instead of hanging up, and sending multiple SMS. Mr. Son can go to H*LL. I have Sprint and I couldn't agree more. Calls never sound right and the people I call can almost never hear me. spint has good service in philly and many people here are happy. i been with sprint 14 years.most people like to talk bad about a company they actually dont have. The new president of Sprint is promising to slash prices and shake up Sprint. Purportedly, he has the full confidence of Soft bank CEO Son. Look for a big Sprint announcement Monday. If they offered roaming on their prepaid divisions, I'd be happy.